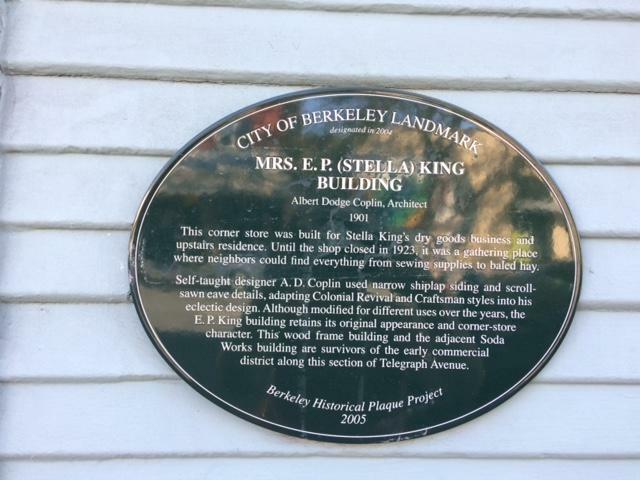 designated in 2005This corner store was built for Stella King's dry goods business and upstairs residence. Until the shop closed in 1923, it was a gathering place where neighbors could find everything from sewing supplies to baled hay. Self-taught designer A.D. Coplin used narrow shiplap siding and scroll-sawn eave details, adapting Colonial Revival and Craftsman styles into his eclectic design. Although modified for different uses over the years, the E.P. King building retains its original appearance and corner-store character. This wood frame building and the adjacent Soda Works building are survivors of the early commercial district along this section of Telegraph Avenue. This marker can also be identified by its HM code. You can use the hashtag #HM1114 in tweets, and any other place where you might refer to this marker, including when searching on this site.